What you feed will grow, and what you starve will wither. That's the essence of Johnn Four's blog post "You Are What Your Dice Eat." It's good advice for life in general, but Four applies it specifically to energy at the table. I want to examine the idea a bit more, because there's a lot of potential depth there. RPGs are social systems: They take inputs from the people at the table, process them, and generate outputs. The game system is only part of the social system at the table. The style, energy, personalities, relationships, and improvisational styles of the people at the table are an even larger part of it. These all combine to create a "machine" that takes what the people at the table bring to it, processes it, and produces the game session as it is experienced by the table. If we open the hood of the machine, we can see a lot of intricate details. Encounter design, weekly scheduling, GM authority, stakes setting, and a lot of other components work to process the table's inputs. Run a Game has examined a lot of those machine parts individually. But let's close the hood again, and look at the big picture, like Four does. Johnn Four has created a clear definition of success in your GMing, and that's what's most valuable. 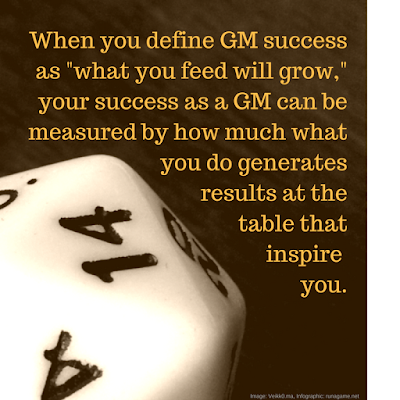 Framing the question of GM success as "what you feed will grow," you succeed as a GM when what you do (the input you create) generates outputs that inspire you to do more. It's about sustainable fun. That's important: It's not just "if everyone had fun, it was a success" because there are many ways you can make a fun game, but some of them sap your energy and fail to inspire you to continue. In RPGs, like life, you have to feed what you want to flourish. If you love it when your players fall in love with your NPCs and start involving them in things, then that's where you should devote your energy -- not to combat encounter design or drawing world maps; but coming up with voices, personality traits, needs, and fears for your NPCs. And ways to make them useful. Unfortunately, like in life, it's not always clear what inputs to feed, in order to produce your favorite outputs. In that case, focus on the "fundamentals" - the things that always seem to produce more energy at your table. I've played with hundreds of different players in my life, and I can list some universal GM fundamentals. But more important to your table is the question of what are your fundamentals? What are the things that produce outputs that inspire you when you do them? Reflect on those, and run the game that inspires you.